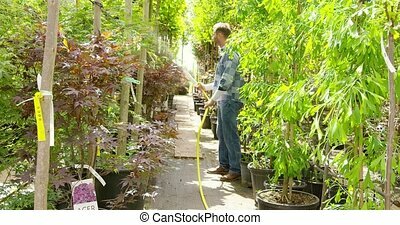 Coworkers in floral shop watering plants. 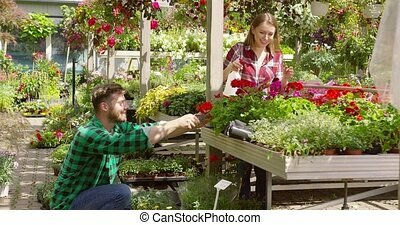 Man and woman wearing striped aprons refreshing flowers with sprayers and watering can while working outside of flower shop. 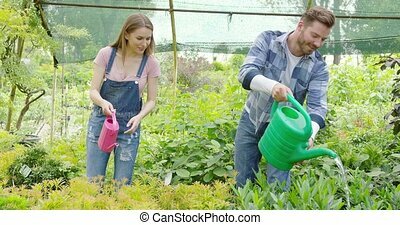 Man and woman wearing striped aprons refreshing flowers with sprayers and watering can while working outside of flower shop. 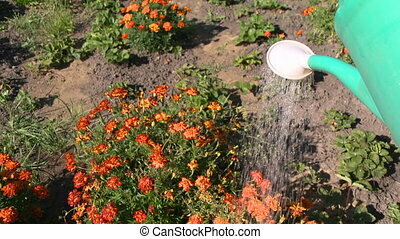 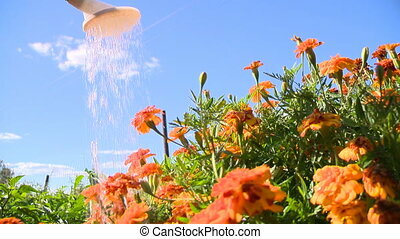 Happy man watering flower and plants in garden. 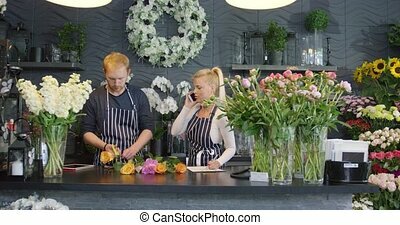 Man in striped apron standing at counter in floral shop arranging colorful roses near female coworker talking phone. 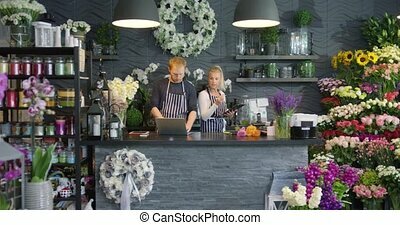 Man in apron browsing laptop while standing at counter in floral shop and talking to female coworker holding file and writing in it. 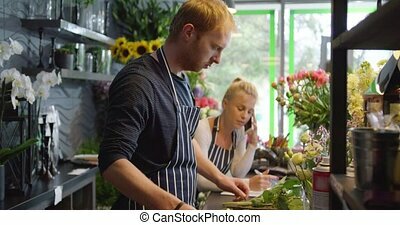 Side view of two young coworkers in aprons working outside of flower shop watering and sprinkling flowers for sale. 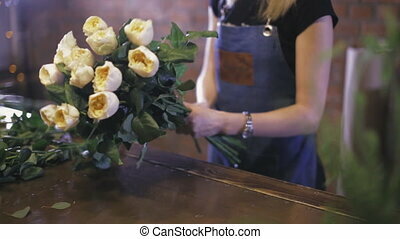 Male worker using laptop while woman in apron standing at counter near and taking payment from woman buying flowers. 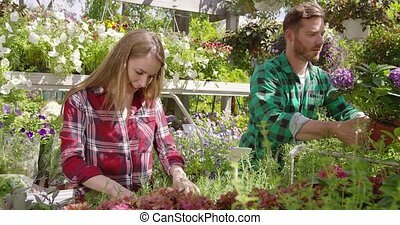 Side view of two young people in uniform working and taking care of flowerbed outside of flower shop in summer day. 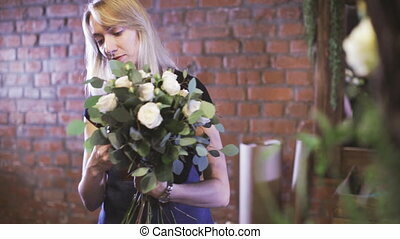 Side view of female employee in green apron working in floral shop and arranging flowers in bouquets. 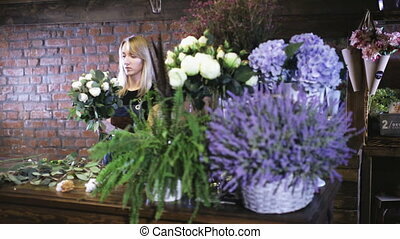 Young female worker wearing green apron and browsing laptop while standing behind counter in floral shop. 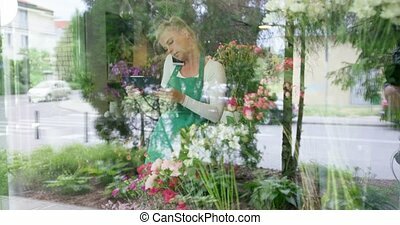 Shot through glass of woman in apron talking phone while holding file and working in floral shop. 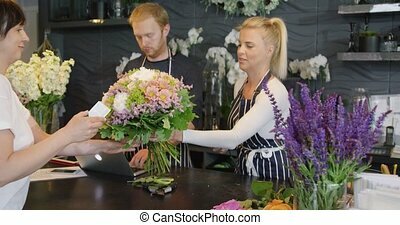 Young blonde woman talking to man while coworking in light floral store talking and helping each other. 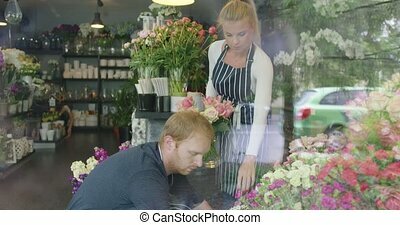 Shot through glass of male and female employees working in floral shop and arranging flowers. 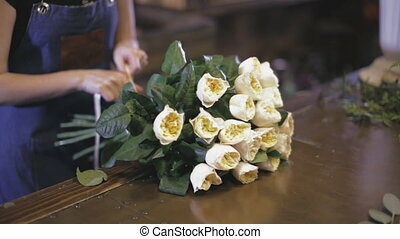 Female florist standing behind counter in shop selling flowers and talking phone while using laptop. 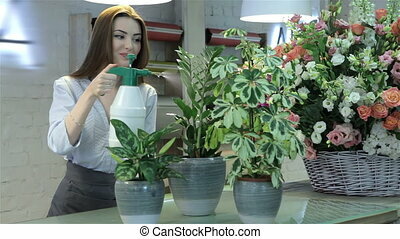 Side view of woman in apron working in floral shop and arranging flower pots on shelves. 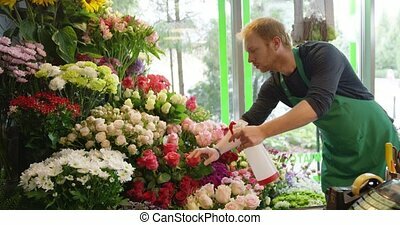 Side view of man wearing striped apron and standing in floral shop arranging flowers near coworker talking phone. 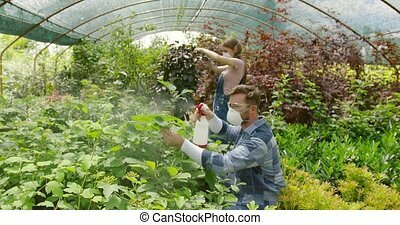 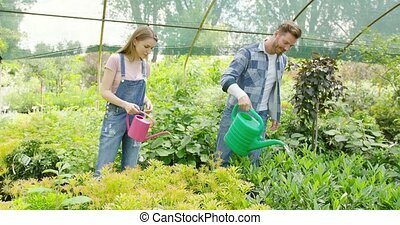 Male and female professional gardeners working together and watering flowers with pot in hothouse. 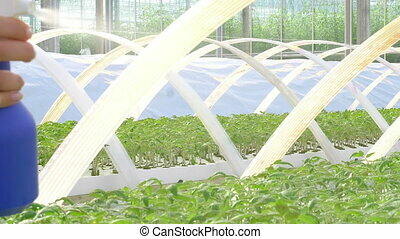 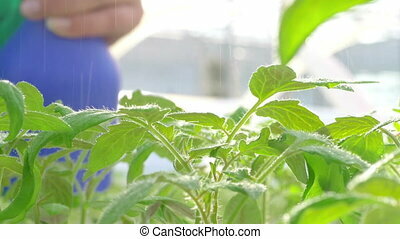 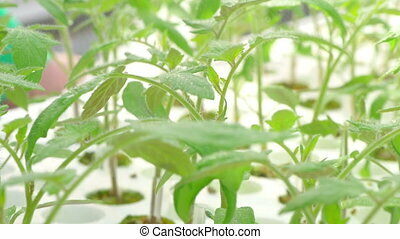 Smiling girl in overall and happy man watering fresh green plant with pots standing inside of greenhouse of garden. 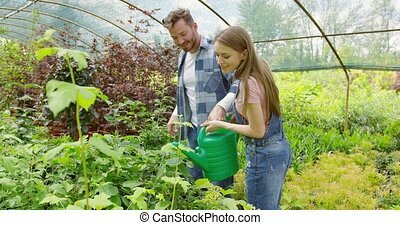 Content man and pretty girl holding watering pot together and pouring fresh water on flowerbed with green plants in glasshouse. 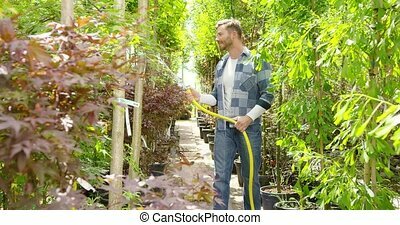 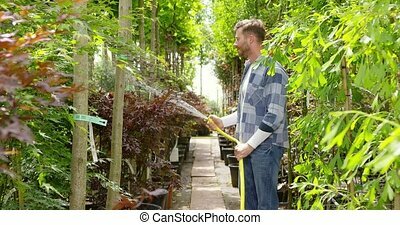 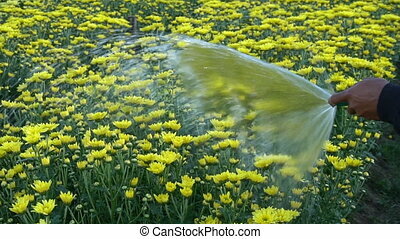 Casual man in shirt holding hose pipe and watering lush plants in garden with powerful stream of water. 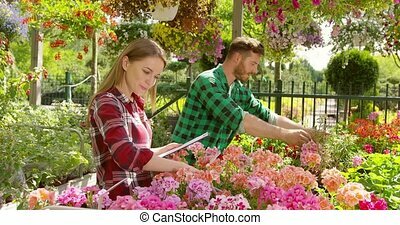 Cheerful man working with flowers standing with woman doing paperwork in the garden. 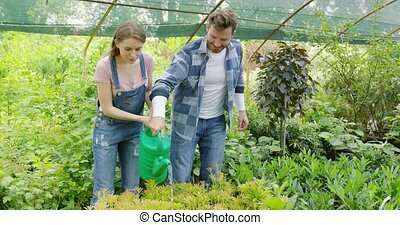 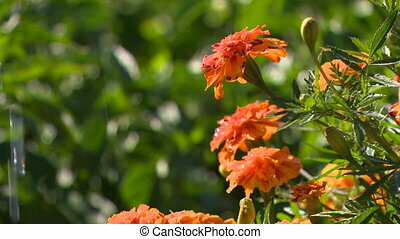 Cheerful man and woman doing professional gardening job and working with flowers in pots together.